Audio Vixen consists of siblings Ross, Christine and Ria Pirrelli. 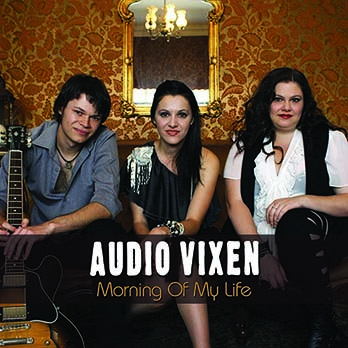 Recently nominated for an Australian Mo Award as Best Harmony Vocal Group, the trio were chosen by iconic music legend Barry Gibb of the Bee Gees to be the support act for his Australian Mythology Tour after he heard Audio Vixen’s rendition of the Bee Gees hit song “Morning Of My Life” which they re-worked, recorded and released as their 2nd EP, working on the project with renowned Australian Guitarist/Producer Peter Northcote, who co-produced the single which also included 2 originals. Following their X Factor experience, Audio Vixen decided to create their very first live concert production and launched it on the live scene performing at special events and major venues throughout Sydney. In this spectacular show “A Salute to Classic Rock”, they pay tribute to some of the great rock groups and artists like Queen, Fleetwood Mac, Bon Jovi, The Eagles, America, Jimmy Barnes and more. Though Audio Vixen only recently achieved national exposure, they’re no strangers to the Australian music scene. Along with their parents, entertainers Jay & Gisele Pirrelli, Ria, Christine and Ross have performed on stages across Australia and overseas since a very young age (Ria and Christine both started at the age of 4 and Ross joined them in his early high school years). Working on stage with their parents gave them the opportunity to learn about the craft of entertainment, harmonies, dynamics, performance technique and most importantly, an understanding of how the industry they are so passionate about works. After a non-stop year which included an opportunity to perform backing vocals for popular UK artist Florence and the Machine, heading out on the road for their EP campaign trail, performing on various TV and radio stations across Australia and opening their music studio “Sounds on Baxter”, Audio Vixen now get set to begin recording their first studio album. They are also currently touring their new production show “A Tribute to The Bee Gees, Everly Brothers and The Corrs”. This show pays tribute to musical family groups throughout the eras.